Light Metal Platers was founded in 1960 as a small metal finishing company. In 2012, the company moved to new ownership by myself - Steven A. Delorey. I have been in the metal finishing business for more than thirty years and have now taken ownership of the company at which I began my career. Light Metal Platers, having been a Corporation since its inception, is now an LLC but all else remains the same. I am committed to continue providing quality metal finishing in a timely manner at a fair price. 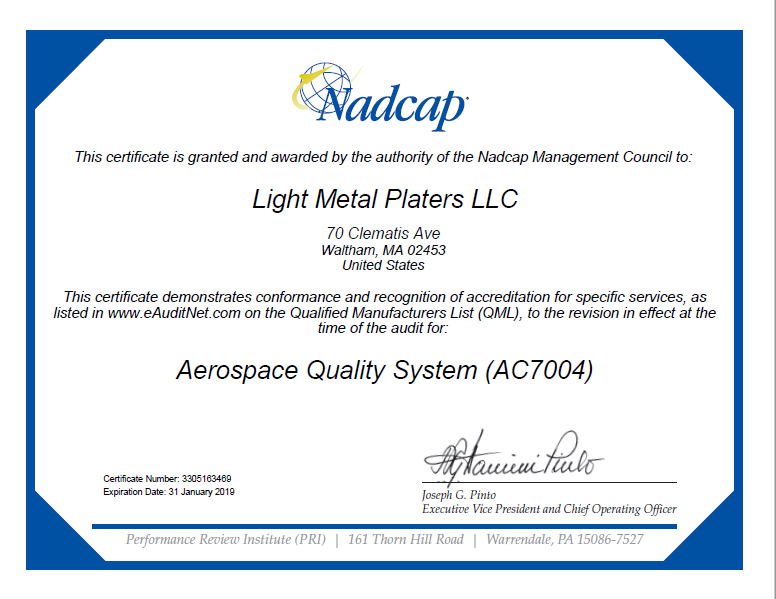 Over the years with good people Light Metal Platers has continually increased our capacity, capability, quality, and regard within the industry. We have maintained the quality standards of the Aero Space and Defense industries for more than a decade and are dedicated to continued improvement.